My Uncle Hall is a great baker and pastry chef. He makes a living doing it and everything. But before he switched careers and started prostituting his skills to the masses, our family had him and the fruits of his labor all to ourselves. As a child, one of my favorites appeared every year late in the fall, or early in the winter. Chestnut Meringue. He had a big chestnut tree in his yard, and all my siblings and cousins would comb the ground under the tree gathering chestnuts, and trying to avoid being pricked by their spikey seed pods. “Pricked” is sort of a gentle way of describing it, “impaled” might be more accurate. His tree was some sort of asian chestnut tree. The story of American Chestnuts, Castanea dentata, almost makes me want to weep. In the early 1900s, more than 3 billion Chestnut trees, more than 25% of the great hardwood forests of the east, were Chestnut, reaching 150′ tall and 10′ in diameter. They were a wonderful source of food, but were also grand timber trees with absolutely gorgeous wood. They all died of an asian fungal blight, Cryphonectria parasitica, . Bye bye. Anyway, enough of the sob story. So what is Marrons aux Mont Blanc? 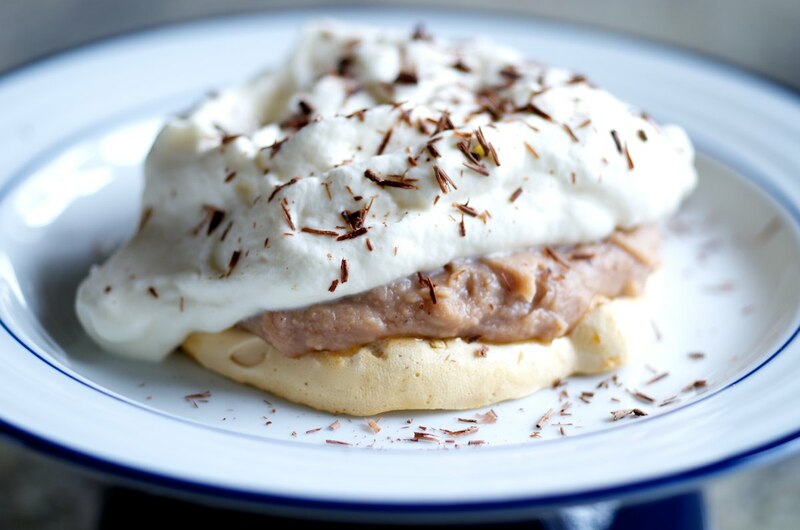 It is a sweet chestnut paste, or purée, sitting on a hard meringue, topped with crème Chantilly (aka whipped cream), with a little grated dark chocolate on top. The nutty, dense, creamy chestnut purée sits below light, airy whipped cream, and above shattery-crips yet super delicate and ephemeral meringues. This dessert is about contrasts. 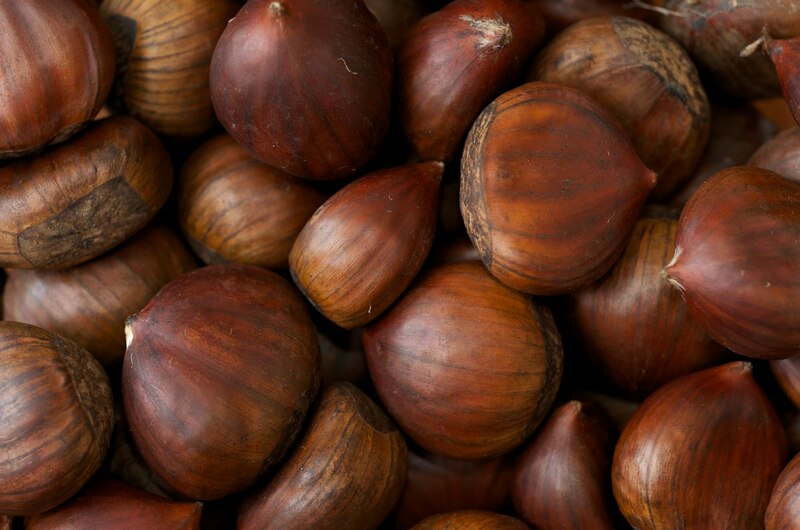 The flavor of a chestnut is indescribable if you haven’t had one, but it is a nutty, sweet, complex flavor. Meringues are always controversial. Some people think they taste like sweet styrofoam. In other words they have no flavor of their own. One way to temper this criticism to to bake the meringues a little longer than usual so the sugars caramelize a bit. Your meringues won’t be snow white, but they will have much more flavor complexity. I tend to be a cook-by-taste kind of person, and I rarely measure ingredients, which I guess is going to have to change a bit if I intend to blog about the recipes I’m making. So this will be one of the last that have no measurements. Score a X shaped puncture into 2lb of fresh chestnuts with a paring knife. Don’t cut off your fingers. Roast them at 425º in a single layer on a sheet pan, until the shells start to peel back, they smell yummy, and the nuts inside are soft when you squeeze/sample one, about 15-25 minutes. Shell the nuts. You can boil them in milk+sugar or water+sugar. Water will be more clean and pure tasting, milk more rich. Sugar to taste, but you want it pretty sweet. Pinch of salt. Boil until they are super soft, and will easily mash with a fork. Reserve the liquid, then purée (with hand blender, blender, food processor, whatev) until they are very smooth. Add back reserved liquid as you purée, until you get a smooth, soft, creamy consistency. Think soft hummus. Meanwhile, whip 6 eggwhites until very soft peaks begin to form. Then gradually add 6 oz sugar, and 1 tsp corn starch, pinch of salt. Beat until stiff peaks form. Pipe onto wax paper into four inch disks, using the back of a wet spoon to flatten and shape them . Bake at 225 for 2 hours, then turn off the oven and let them rest for another 1-2 hours before you open the door. As the meringues cool, they will harden. Cool meringues, then spoon on chestnut purée, and top with a dollop of very softly whipped cream, sweetened to taste. Dust with grated dark chocolate. Bask is the adulation of your peers and loved ones. This was written by cedar. Posted on Thursday, February 10, 2011, at 11:27 am. Filed under Recipes. Tagged dessert, history!, nuts, winter. Bookmark the permalink. Follow comments here with the RSS feed. Post a comment or leave a trackback.